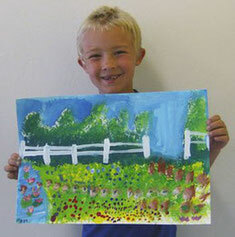 Private art lessons can be arranged at any time, including weekends. Just come in, call, or use the Contact Us tab (under About tab above) to inquire about private lessons. Fridays (and some Wednesdays) are reserved for Children's Private Art Lessons, which are available for students 1st grade and up. Hours vary depending upon time of year and calendar schedule. Fees for private lessons are due prior to or on the day the Private Lesson is provided. Fees are currently $10 per hour. There may be other students present during a private lesson. The presence of more than one art student in the studio can enhance a student's art experience and the quality of his or her time in the studio as the art process is shared and evaluated. Students work individually on their projects and are free to share their impressions and experiences with one another as desired. 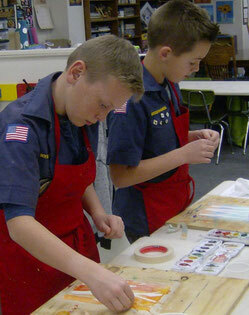 Private lessons usually include ongoing drawing lessons. Drawing is a fundamental skill that is universally beneficial for further art exploration as well as useful within other academic studies. Art media studies using media such as acrylics, watercolor, tempera, soft or oil pastels, colored pencil, or mixed media exploration can scheduled, as well as art media and techniques in the style of one or more of the Masters. Private lessons can also be used to create a project from a past or future scheduled class that the student is (or was) unable to attend. Just let us know what project your child would like to create!